Master emphasizes the power of inner concentration. It was indeed the greatest blessing for the Japanese people that Master included our country in Her recent lecture tour. 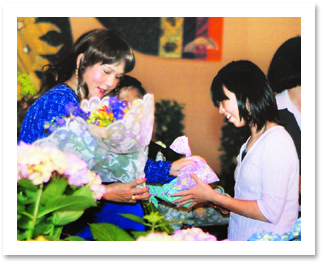 It has been seven years since She gave Her last lecture in Japan. Once Master's tour schedule was confirmed, fellow practitioners threw themselves enthusiastically into the preparation work. Noticing that there were too few publications in Japanese to provide sufficient information about Master to the public, the Translation Group began working wholeheartedly to prepare News magazines, books and video subtitles in Japanese, finishing the task much more quickly than usual. Everyone knew that this work had been accomplished so speedily through Master's blessing. With people in Japan becoming generally inclined toward material values in recent decades, very few were interested in spiritual practice, or had much idea about God or the Buddha. However, recently, and especially this year, the Japanese have shown a discernible change in their willingness to pursue spirituality. Therefore, we believed that Master's lecture would represent a new turning point in Japan's spiritual growth. Using their inner wisdom, fellow practitioners contributed many suggestions on how to let people know more about Master, and how to make Her lecture a success. For example, realizing that Japanese people are generally reluctant to receive pamphlets, we came up with the idea of wrapping the flyers like gifts, with tissue paper inside transparent plastic sheets. Our hope was that this approach would make the flyers more appealing to the recipients. The result was fantastic! When we distributed these "gifts" to passers-by in Tokyo and other cities, many were immediately absorbed in reading the flyers, which were adorned with beautiful photos of Master. Others were impressed by the devoted work of the fellow practitioners, and thanked them sincerely. In no time at all, many boxes of flyers were emptied, and the distribution project ended successfully. At the same time, we also dispatched the news about Master's lecture to the Web sites of various groups and individuals. As the date of Master's lecture approached, we began advertising and also inserting leaflets in local newspapers. After the newspapers were distributed, inquiry phone calls and emails began coming in incessantly. This warm response greatly exceeded our expectations. The week preceding the lecture was the "Golden Week" holiday in Japan, and many people were abroad for vacation. As we were distributing flyers, some people told us that they had attended Master's lecture in New Zealand; others said that they had seen many advertisements for Master's lecture in the MTR (underground train) stations in Hong Kong. Instantly, we felt as though all of Asia and Oceania was bathing in Master's divine light. Not all went easily, however, in preparing for the Japan lecture. While it appeared that Master's activities in other countries were always accomplished smoothly, in Japan we felt crippled by many limitations and conceptual obstacles. 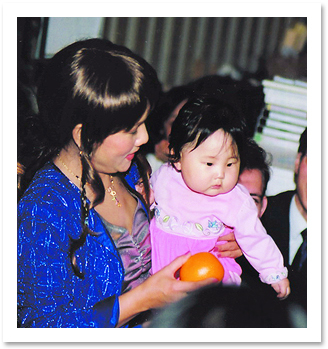 For instance, we contacted several newspapers and radio stations very early on, hoping that they would report on the "Ocean of Love" lecture. But after reading our materials, they told us that they could not do any prominent promotion of spiritual groups. Just as we were beginning to feel upset and frustrated by this setback, we received an important phone call. The sister answering the call was precisely the one who had approached the media and failed, while the person calling was a 74-year-old former journalist, who had previously worked as a reporter for a major Japanese newspaper, knew key people in many civic organizations, was familiar with a facilitator of the largest women's organization in Japan, and expressed a wish to know more about Master's lecture. So, our sister immediately went to meet him. After she discussed Master and the lecture with him, he was very touched, and promised to spread the news to representatives of major groups, as well as to the women's organization he worked with. 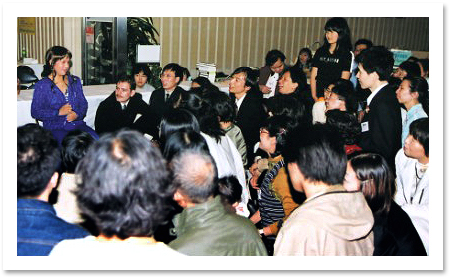 As a result of his sincere interest in Master and Her teachings, he also brought several guests with him to the lecture. It is often through continuous setbacks that we can empty ourselves completely. If in the face of these obstacles we can still maintain our faith to work for God, then God will naturally open up new paths for us. And without noticing it, we will accomplish all of our tasks smoothly. Finally May 7 arrived, and the lecture was held at the U-Port Kan-I Hoken Hall in Tokyo. Wearing a silver-gray blouse, long blue skirt and blue jacket, and with Her hair tied at the back, Master looked very beautiful and graceful. The background of the stage was decorated in the pattern of a huge kimono, featuring a golden sun, silver moon and many stars, which symbolized peace in the universe and the oneness of all Creation. The stage itself was decorated with colorful flowers, fruits, and green plants, making it very pleasing to the eye. Before Her lecture, Master asked the audience members to silently pray for peace and prosperity in Japan and the world. We also prayed that worldly people would become enlightened and enjoy happiness forever. In Her lecture, Master pointed out that there is something within human being that makes us know that we are great, and when we find it we will know that we are from God, that we are Buddha. Some of us find a portion of this something, and some of us find the totality of it. The Buddha and Jesus found it completely, as did many other Masters, such as Mohammed and Krishna. When they found it completely, they became Buddha, they became completely enlightened, they became one with God, and they knew where they came from and where they would go after leaving the physical body. And then they told us that we also have God Nature within us, that we have God dwelling within this physical temple. If we find even a portion of this magnificent quality, this magnificent Original Nature within us, we will become wiser, more intelligent, happier, more peaceful and more loving. Some people in this world have found a part of this greatness, and therefore they have become greater than other ordinary beings who have not found it. But all of us have this greatness within us, and any time we choose to know this greatness or want to make use of this greatness, we can always do so. In order to find this greatness, this Original Self or God Nature of all beings, we simply need to concentrate in the right place and in the right way. The younger generation in Japan is bathed in the infinite light of God. Even in this physical world, if we want to be successful at anything, we need concentration. And I think the Japanese people know that best. Most companies in Japan send their employees to Buddhist temples to learn the Zen method of concentration so that the company will have more efficient workers. Japan is one of the very few nations (if not the first or the only nation) that is aware of the power of inner concentration), and perhaps that is why Japan is very successful in many aspects. But in order to be happy, to be more peaceful, and to gain lasting happiness, we also need to use our concentration to go to a higher dimension to learn the nobler purpose of life, the nobler wisdom of the universe. Then we can become complete beings, not just successful executives in this world, but also saints, Buddhas, in order to bless the world and the universe. With just a little concentration, people can be very successful in this life already, so if we apply more concentration, deeper concentration, and in the right way, we will be successful even in heaven, and can leave this physical life any time we want, visit heaven, visit the kingdom of the Buddha, and come back again to discharge our duty on the planet and vice versa. We always envy people who are more intelligent or more successful than we are. It is perhaps because these people know how to make use of their inner wisdom more than some of us that they become very intelligent, very sharp, and they know how to solve problems more quickly than many of us who do not make use of our inner wisdom. That's why the Buddha encouraged all of us to find our own God Nature, our own wisdom inside. That's why the Bible tells us "Seek ye first the Kingdom of God, and all other things shall be added unto you." At any time, we can find this kingdom of God, this God Nature, which has made all the Masters great, and which makes every one of us great, because we are originally great. During the question and answer session, the audience raised many spiritual points. One person spoke about feeling a very strong energy radiating from Master toward him during the lecture. Master said that everyone is not ordinary, everyone can develop this kind of power that makes you feel elevated, and then everyone around you feels elevated in just the same way. Not only can She, but also we, can have the same energy that radiates all over our surroundings and around the whole planet. Everyone who is near us, who is sensitive and a little spiritually elevated, can feel it. This energy is the God Nature, the God within us; once we have awakened this Power, we are powerful like that, and at that time, we can bless many people; we can bless the whole world with our energy. 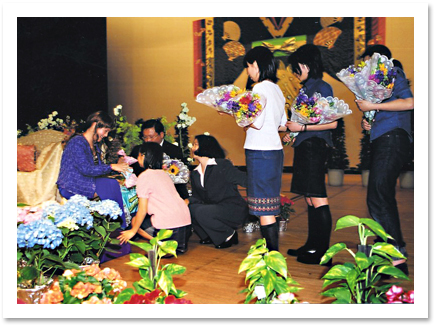 When the lecture ended, several children and teenagers offered flowers to Master, who graciously accepted them, and then shared all the flowers and fruits on the stage with the audience. After the lecture, making use of the time while preparing for the initiation, we held a press conference to address the questions of news reporters and other media representatives. Among them was the chief editor of the periodical Religious News, who commented: "In our magazine, we published a series of stories about the Buddha, and I personally have tried to learn more about what a Buddha is through the study of news reports and books. My conclusion is that, once we have realized our Buddha Nature, we are the Buddha. In Master's lecture today, I noticed that Master was saying precisely the same thing. As a religious news specialist, I have visited with many Japanese religious leaders. Having listened to Master's discourse today, I realize that She is a truly Enlightened Master. Master has truly come from Nirvana, and Her wisdom is extraordinary." The chief editor also expressed a hope to remain in contact with us. From these bits and pieces of information, we can see how Master's divine messages float in all directions like the flying petals of wind flowers: Once they come to rest in people's hearts, they will surely grow into beautiful flowers. We feel that Her lecture has been a great blessing for Japan. May more and more Japanese people awaken to the God Nature within them, and walk in the way of the heavenly light.